Our lovingly renovated and country-style rooms tastefully furnished cottage has the certification of the DTV with F **** and is beautifully situated in Wackersberg to 735 m. It stands in the middle of the lovely Alpine foothills 2 km above Bad Tölz. From the property you can enjoy beautiful mountain views. This lovely home has 100 square meters and stands alone on the 800 acre lot with 2 south facing terraces, 2 garages and has 4 beautiful rooms in different equipment and apparatus. The new, cozy kitchen with coffee machine and dishwasher and an attractive Bavarian country house corner, invite you to linger. 2 modern TVs each flatscreen and 1 of them with Internet browser, Blu-Ray player, Internet with Wi-Fi and telephone are of course available. The house has 2 beautiful bathing rooms. One with walk in shower and beautiful rain showers, a veritable shower fun. 2 toilets and beautiful bright mirrors are naturally present. Moreover, there is also a full-length mirror, a hair dryer and plenty of light. 3-bed rooms. The existing 2 garages offer plenty of space for cars, bikes, and more. What is a nice added benefit, especially in winter. For our guests who want to bring their dog is just across a beautiful forest, this is ideal for extensive walks and a walk transitions. One Beautiful nearby idyllic streams and can walk directly through a beautiful forest trail to Bad Tolz. On the way you just go past the most beautiful vantage point over Bad Tölz. The Jahn-game hunter monument. Beneficial for dog owners is certainly worth noting that the property is completely fenced. Environment of Mountain View Bed and Breakfast: In a cozy walk through the gardens are just Tolz Bad Tolz, with its historic old town and the famous market street with numerous murals in less than half an hour. Many traditional events take place in and around Wackersberg. The hiking and skiing Brauneck Blomberg and are just minutes away from the house. The hiking trail leads through Wackersberg Bad Tolz. There is also a short distance from the monument of Spielhahnjager, which offers the best view over Bad Tolz and the opposite Calvary with its beautiful church. Only a few minutes walk from the house. Many Bavarian inns invite you to enjoy and feast. The city of Munich with its famous Oktoberfest and other events can be reached in just 50 minutes. Garmisch Partenkirchen, the castles of Neuschwanstein and Linderhof, and the monasteries Reutberg Ettal and are easily accessible. The same applies to the Tegernsee, Lake Starnberg, the Sylvensteinsee, the Schliersee, Lake Kochel and the Walchensee. In close proximity is the Good Bohmerhof for riders and riding horse fans with over 90 horses. Leisure and sport for everyone: Whether paragliding, fly-fishing, skiing, cross country skiing, cycling, carriage rides, sleigh rides, zip lining, rafting, kayaking, ballooning, hiking, swimming and more. Found here in our region each his personal pastime again. The golfer's paradise around Munich with more than a dozen stunningly beautiful golf courses do to his peers. Whether Margarethenhof Valley, Oak Ried, Eschenried, Garmisch, Bad Tolz, Bad Wiessee - everything a golfer's heart desires is easily accessible. Many walks invite you to discover the Isar valley. The Alpamare in Bad Tolz offers swimming pleasure with numerous slides, sources of iodine, wave pool and much more. Day trips to Austria are available anytime, for hiking, skiing, biking, sledding or otherwise. The open air museum Glentleiten, the Franz Marc Museum and the Farm and Winter Sports Museum Wasmund are worth seeing. Visits to the zoo in Munich, Innsbruck and Poing are always nice goals! Many of our guests also the possibility the Swarovski Museum in Wattens (A) or the numerous castles of King Ludwig to visit. Very many more suggestions for attractive excursions can be found in our cottage. There is extensive information material for you, especially our ever-popular restaurant recommendations. Worth mentioning is the famous annual Leonhardiritt abide by Bad Tölz. This is far beyond the city's borders famous and absolutely worth seeing highlight in every first week of November. Numerous teams of horses with decorated floats and worth a great deal of tradition make their way from the horses ordination on Calvary to the entire market street. Is accompanied by all the beautiful costumes of the local men and women. The known Goißelschnalzer the costume and heritage societies accompany the whole. In a clear wallet you will find information about practically everything makes sense and perhaps even necessary. Starting with a detailed list of restaurants with many culinary tips, an overview of the numerous shopping on site, as well as lists of doctors, pharmacy services, cleaning, laundry, and much more. In addition, getting all event offers from Bad Tolz and surroundings in beautiful brochures available at the cottage. The 2 bathrooms are equipped with high quality NEW fittings, each have large washbasin, a toilet, and each one of the bathroom is a large walk-in shower with modern NEW RAIN Rain Shower Head available. Modern radiator with textile drying facilities are available in both bathrooms. Similarly, large mirrors and a hairdryer. Wir haben eine Woche im Bergeblick verbracht und durften den Garten und das private Ambiente in der sensationellen Lage geniessen. Das Haus ist sehr geschmackvoll eingerichtet und voll ausgestattet. Gerne kommen wir wieder! Ferienhaus BergeBlick is a really great base for a family holiday in Bavaria. The house is well equipped and very cosy and the owners were so very helpful. Even before we arrived we knew where the supermarkets were and when they were open (very important with 3 hungry teenagers!) and we had been emailed details of walking routes so we could really make the most of our trip. We travelled from the UK through the channel tunnel, France, Belgium, Luxembourg then to Heidelberg and onto Wackersberg. I chose this location for the proximity to Munich, the alps and it really is a great spot with lots to do in the area. Having driven so far the house is really comfortable and has every amenity you will need to enjoy your stay whatever the weather. The condition and cleanliness were excellent throughout. We have three young children and the house accomodated us very well with lots of space. Andrea was a joy to deal with at all stages with quick communication, lots of help and on arrival invited us to the local festival which made us feel so very welcome. Excellent value for money, well recommended, I hope we can return one day. Nach langer Fahrt konnten wir unseren KIndern einen schönen Garten zum toben und spielen bieten. Das Haus ist sehr geschmackvoll und gemütlich eingerichtet. Jeder konnte seinen eigenen Platz im Haus und Garten finden. Es hat uns sehr gefallen und wenn wir in dieser Ecke von Bayern noch einmal Urlaub machen, wäre dieses Haus die 1.Wahl. Sehr schön gelegenes Ferienhaus - viele interessante Ziele sind gut zu erreichen. Schöner Garten zum relaxen, geschmackvolle Einrichtung - für 4-5 Personen optimal, allerdings könnte ein zusätzliches WC/Bad nicht schaden.. Wir haben uns sehr wohl gefühlt auch dank der hervorragenden Restauranttips im Infoordner von Frau Tien. Perfekt. Tolle Aussicht von der Terasse auf den Blomberg.Domizil ist Super zum Wandern geeignet. Auch Regentage kann man gut aushalten da ein großer Flat-Screen vorhanden ist. Sehr viel Info-Material über gute Retaurants und Einkaufsmöglichkeiten. Wackersberg is located just 3 km above the historic Old Town Bad Toelz. With the Bavarian Oberland Bahn is easily one arrived in about an hour from Munich (main station). Wackersberg is not only known from the ever-popular television series - The Bull of Tölz. From our house you can enjoy the view of the Blomberg (1 248 m), the Brauneck (1 540 m), as well as the Probsten- (1 598 m) and Benedict Wall (1 801 m). Wackersberg is located in a beautiful alpine landscape. Its historic village with its church and the famous plague chapel can be reached within walking distance. Likewise, hosted Waldherralm at the foot of Heigl head. The roof caves as well as the Längental are well worth the walk. Numerous castles, museums and lakes are situated close to convenient, entertaining road trips. Wackersberg every season offers many fine leisure opportunities. Whether hiking, skiing or Radln, everything can be experienced from here fantastically and enjoy hearty! Other Activities: Ballooning, kayaking, rafting, white water rafting. Golf: Bad Tolz and Wackersberg there are two 9-hole golf courses with attractive paths and beautiful views over the Isar valley and of the foothills. The golfer's paradise around Munich with more than a dozen stunningly beautiful golf courses do to his peers. Whether Margarethenhof, Valley, Eichenried, Eschenried, Garmisch, Bad Tolz, Iffeldorf, Bad Wiessee - everything a golfer's heart desires is easily accessible. In the cottage you will find a detailed overview. 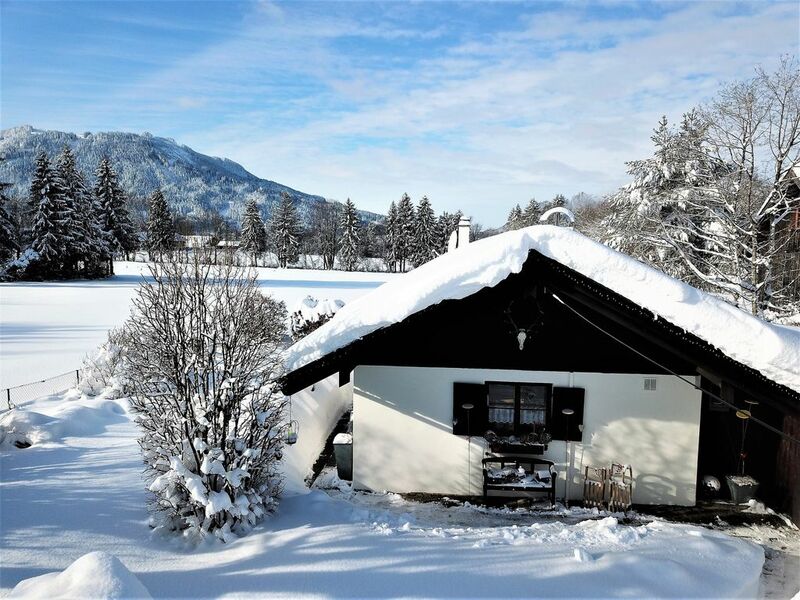 Ski: The ski Blomberg can be found just 2 km away from your holiday home. It is considered a trip idea in all of Bavaria with its summer and winter toboggan runs and the corresponding slopes. The Brauneck in Lenggries is located 7 km away and offers a true winter paradise. The ski area has everything to offer to 34 km of ski runs everything your heart desires. Both beginners and advanced skiers and snowboarders come here at your expense. Numerous ski schools and ski kindergarten inspire our recent snow fans. From the Olympic course with moguls through to family-friendly slopes's all there. Numerous idyllic huts and pastures with beautiful panoramic views invite you to linger. A mountain railway to assure rapid entry into the ski paradise. Alternatively, the mountain can be conquered through tows. On numerous trails located Nordic winter sports can be enjoyed. Even in Wackersberg there is trail access points. Die Wochenpreise gelten bei einer Belegung von 2 Erwachsenen mit Kind(ern) unter 14 Jahren. Jede weitere Person kostet 30 EUR pro Nacht und beinhaltet sämtliche Nebenkosten. Ein Hund kostet 10 EUR pro Tag sowie 20 EUR Reinigungsaufschlag. Kurtaxe -.50 EUR/Tag für Erwachsene. Selbst wenn nun bereits Ihre Wunschwoche belegt ist, reservieren Sie schon heute Ihren perfekten Termin für die neue Saison. Ein Wäschepaket kann optional gebucht werden. Es beinhaltet die Bettwäsche sowie Dusch- und Badetuch und das Beziehen der Betten zur Anreise. (25 EUR/Person).